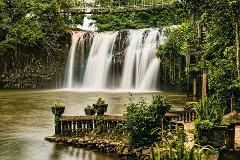 The complete Rainforest, Waterfalls, Wildlife and Paronella Park Tour! See it all during the day then at night for a completely different perspective. The Castles and Waterfalls of Paronella Park are spectacular when illuminated at night!! Visit the amazing Kuranda Village by bus! Our comfortable coaches pick up and delivery you directly to your Cairns hotel. Transfers are fully guided. Stop at Henry Ross Lookout included. Visit the amazing Kuranda Village. 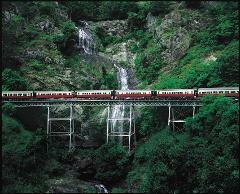 Travel up on the Historic Kuranda Railway and return by coach. Cairns Hotel transfers included. Visit the amazing Kuranda Village, perched on top of the ranges behind Cairns. Take the Kuranda Scenic Railway on the way up the mountain and the scenic Skyrail Cableway down. Cairns hotel transfers included. Visit the amazing Kuranda Village, perched on top of the rainforest covered mountains behind Cairns. Take our comfortable coach up in the morning and return in the afternoon on the Skyrail Cableway. All Cairns hotel transfers are included. Add the ultimate 60-minute ATV experience to either the Train up Skyrail back or Bus up Skyrail back option onto our Visit Kuranda Tour and enjoy a day full of exploration and adventure! 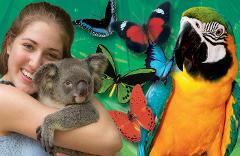 Add on the 3 park pass onto any of our Visit Kuranda travel options (bus up/bus back, train up/bus back, train up/skyrail back or bus up/skyrail back), be immersed in animal interactions at Koala Gardens, Butterfly Sanctuary and Birdworld! Koalas, Kangaroos, Wombats, Cassowaries, Wallabies, Snakes, Lizards, Birds and lots and lots of BIG CROCODILES!! Join us in our comfortable air-conditioned bus on a half day to visit to the largest Zoo, closest to Cairns. Koalas, Kangaroos, Wombats, Cassowaries, Wallabies, Snakes, Lizards, Birds and lots and lots of BIG CROCODILES!! 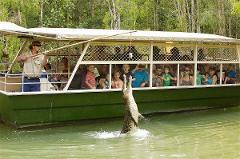 Join us in our comfortable bus on a full day tour to visit the largest Zoo, closest to Cairns. Tjapukai is where Australia Begins! 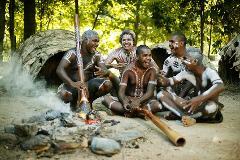 At Tjapukai you can get hands-on throwing Boomerangs and Spears or learning to play the Didgeridoo. Alternatively, sit back and relax as Local Native Aboriginal Performers tell stories through dance. 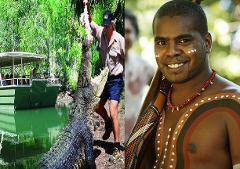 All in a day - Visit Cairns' biggest Zoo with the most comprehensive listing of Aussie Animals as well as the amazing Tjapukai Aboriginal Cultural Park. This is the quintessential Aussie tour and a must for all! Want to get EVEN closer to Australia’s native wildlife? With a small group of maximum 4 people, you can interact with 5 different animals up close and personal. 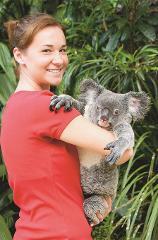 Every encounter will include a Koala cuddle and souvenir photo. Nibble on a scone with jam & cream while an adorable koala beside you delights in their own morning tea consisting of their favourite eucalyptus leaves! Plus more Aussie animals such as Wombat, Kangaroos are waiting for you to visit! 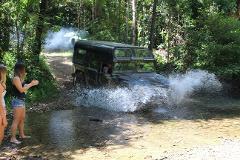 Visit the World Heritage Rainforest and enjoy the adrenaline rush in our H1 military Hummer. 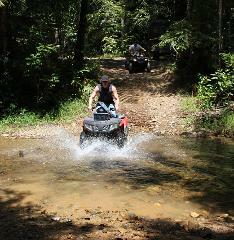 Perfect way to add some excitement in your Cairns visit! 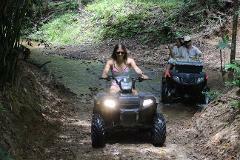 Visit the World Heritage Rainforest by riding your very own ATV 4 Wheel Buggy. No Experience required! Family Friendly! Perfect way to add some excitement in Cairns. 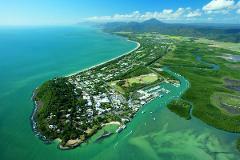 Only a short drive north of Cairns, the vibrant atmosphere in Port Douglas is one that must be experienced! The well-known resort town’s main street is a shoppers’ paradise, especially on every Sunday when the amazing Markets is on! Revive and relax in the beautiful surrounds of Palm Cove. Well known as the ‘Spa Capital of Australia’. Enjoy a fine dining in a waterfront restaurant or take in the tropical wear at the quaint boutique stores. Visit Kuranda by taking the famous historical Kuranda Scenic Railway and Skyrail Rainforest Cableway and visit Hartley's Crocodile Adventure in the afternoon! You can have it all in just one day! Skydive in the morning and Paronella Park Day Night Tour in the afternoon. Departs 8am Returns 9pm. All entry fees and hotel transfers included. Entrance to Kuranda Koala Gardens with a Koala souvenir photo. Must purchase with one of our Kuranda Tours. Visit Kuranda by taking the famous historical Kuranda Scenic Railway and Skyrail Rainforest Cableway and visit Tjapukai Aboriginal park in the afternoon! You can have it all in just one day! Visit the amazing Kuranda Village, perched on top of the ranges behind Cairns. Take the Skyrail Cableway on the way up the mountain and the 2pm scenic Kuranda Railway down. Cairns hotel transfers included. Visit the amazing Kuranda Village, perched on top of the ranges behind Cairns. Take the Skyrail Cableway up the mountain and the 3:30pm scenic Kuranda Railway down. Cairns hotel pick-ups ONLY included. Own way back from Cairns Station. Visit the amazing Kuranda Village, perched on top of the ranges behind Cairns. Take the Skyrail Cableway up the mountain and the 3:30pm scenic Kuranda Railway down. Cairns hotel transfers included. Visit the amazing Kuranda Village, perched on top of the ranges behind Cairns. Take the Skyrail Cableway up the mountain and the 3:30pm scenic Kuranda Railway down. 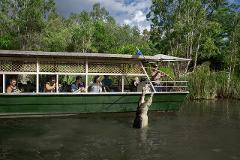 Cairns hotel transfers, Koala Gardens, Kuranda Riverboat Cruise included. 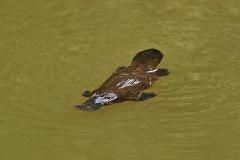 Kuranda full day tour including Army duck tour, Skyrail cable-way and Kuranda scenic-train. Provide lunch at Kuranda hotel. 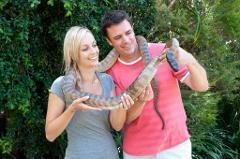 Doki Doki animal watching tour is one of the iconic tour in Cairns. 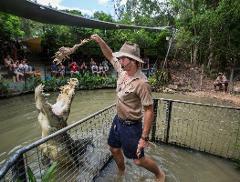 All in a day - Visit Cairns' biggest Zoo with the most comprehensive listing of Aussie Animals as well as the amazing Tjapukai Aboriginal Cultural Park and the Cairns Aquarium. This is the quintessential Aussie tour and a must for all!